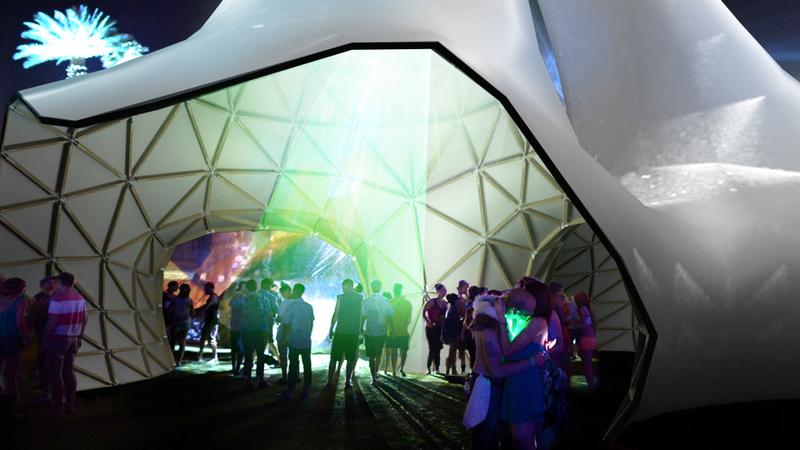 Combining efforts with Invisible Light Network, DIVISION was asked to propose an outdoor canopy for Coachella 2014. Together we designed a wind fabricator that blends ancient structural engineering with modern design, enabling a naturally cool, shaded microclimate by harnessing wind and the power of evaporative cooling. We envisioned an installation that would build itself, listening to the performances that surround it while continuously fabricating structural elements in an automated, on-site production facility. It would become a unique, physical record embodying the music of Coachella. Additionally, we would feature a mind-blowing reactive laser installation that would respond to the movement of the crowd to create an awesome spectacle. Using graceful towers, windcatchers capture cool prevailing breezes and direct them to ground level, creating a natural system of ventilation which produces profound cooling effects. These designs principles allow us to create a continually cooled shade structure that requires zero energy. We would enhance the chilling effect by placing a system of misters inside the towers to add an additional layer of evaporative cooing - creating a comfortable, green oasis from the sun. By day, the wind fabricator is a cool refuge from the Indio sun. At night, the installation comes alive as an unforgettable visual experience. Lasers placed in each of the wind towers would scan down through the structure, creating ever-changing 3D geometries that illuminate both the crowd and the motion of the cooling air through the structure. The lasers would be linked to a system of motion sensors installed at ground level. The movement of the crowd would drive the movement of the lasers, creating a light show that reacts instantly to the mood of Coachella, transforming motion into visual performance. 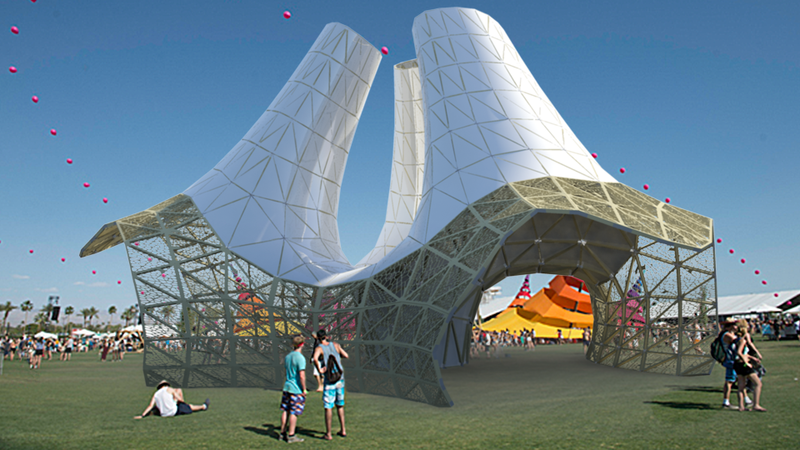 The wind fabricator wouldn't just react to the crowd - it would also listen to Coachella itself. Over the course of the festival, microphones installed in the structure would listen to sounds around it, analyzing the musical performances - and using that data to drive a CNC machine integrated into the installation. This process would continually fabricate additional panels for the structure: each panel would be unique - defined by the music being performed at the moment it was built. This installation would build itself as Coachella happens. At the end of the festival, the structure could be disassembled and the panels given away as VIP gifts. What could be more memorable for a Coachella performer than a sculptural piece created by their own music?